Lara has been spoilt with a couple of pairs of the gorgeous leather shoes made by Inch Blue. Lara has been wearing what I would term 'real' shoes for several months now. 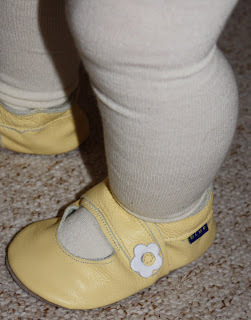 Before she walked, Lara wore soft leather shoes if we were going out somewhere where I felt she would need to keep warm, or where I knew she would be scrabbling around on the floor. Even now, I try to keep her in soft shoes such as Inch Blue's as much as possible as they allow her feet more freedom and don't restrict growth. Inch Blue is a welsh family business who make handmade shoes for babies of an incredibly high quality. When I compare Lara's Inch Blue shoes with the cheap equivalent we bought from ebay in the spring, I am astonished at the differences. The Inch Blue leather is soft and thick – comfortable and supportive rather than just a flimsy wrap around the feet. The Inch Blue colour has lasted Lara's wear and tear unlike her old ones where the pattern flaked off within days of wearing them. The shape of the Inch Blue shoes is so much more exacting and more dainty – her old ones are very clown-like and not as beautifully tailored to the natural shape of the foot. Inch Blue care about their materials, they care about their designs and they care about the environment – which is why their products start at around £17 for a pair of shoes and aren't found for pennies on ebay! Lara has two pairs of the incredibly lady-like Mary-Jane shoes in pastel colours. We love them. When I chose them from the Inch Blue website I had a very had time deciding. They have a wide range of fun designs for girls and boys from 0-4 years old. Sadly, Lara can't have one of every pair – there just isn't enough room for that many shoes in our house! 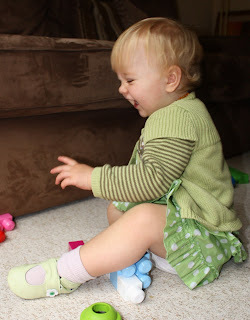 Lara loves wearing the Inch blue leather shoes around the house to keep her toes warm. 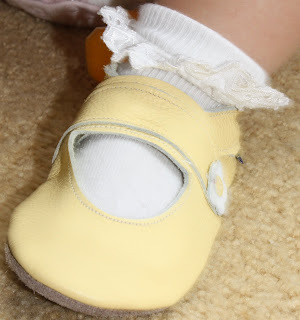 I think she particularly likes them because she is able to take them on and off herself – the small piece of elastic that holds them in place is that bit more manageable for her tiny fingers than buckles and velcro on her bigger, more formal shoes. One of my favourite items on the Inch Blue site is the wintery Cwtch boots. Available in pink, blue and brown these little sheepskin boots are stylish, practical and lovingly handmade, hence the name 'Cwtch' which means 'hug'. Go and take a look at the shoes on the Inch Blue website – I think you'll be surprised by the range! They have some wonderful festive shoes in stock now such as reindeer, snowflakes, robins and angels. They also have some beautiful gift sets that would make any new parent happy.